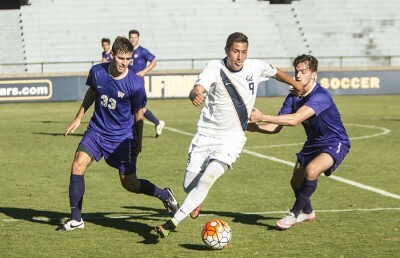 Just one week ago, the Cal men’s soccer team was reeling like a middle-aged man on a fishing trip. The Bears sat at the bottom of the Pac-12 and hadn’t won any of their last six games. Now they have won two in a row and find themselves right back in the thick of the conference standings after turning around a season that appeared to be spiraling downward. At home, Cal (7-5-2) beat San Diego State (6-6-2), 4-3, and UCLA (7-7-1) by the same score after losing to the Aztecs and the Bruins the week before while on the road. 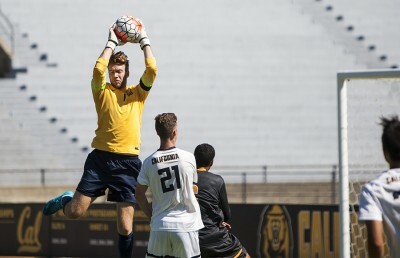 Cal, which came into Friday’s game against San Diego State riding a 367-minute scoreless streak, had a strong start. Junior forward Christian Thierjung — who was riding a slump of his own, having failed to score since Sept. 20 — gathered a loose ball in the box. He smashed the ball past the goalie to give his team a 1-0 lead in the first minute. 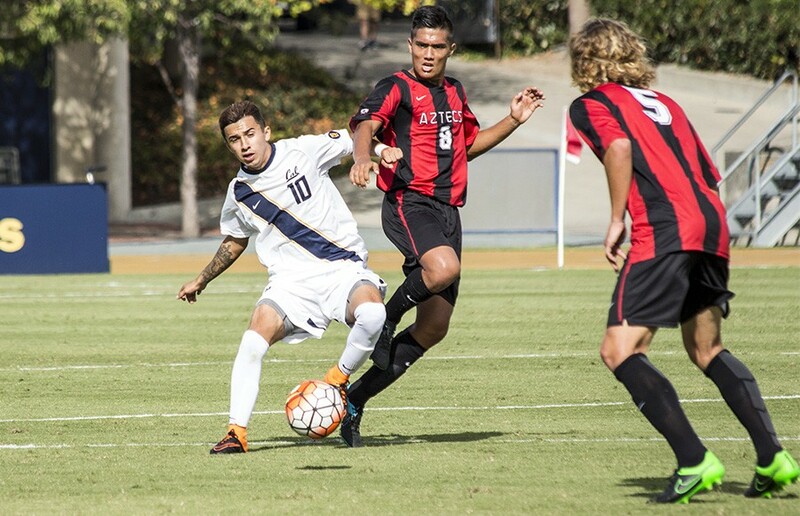 The game was a back-and-forth affair, with the Aztecs notching an equalizer in the 14th minute. Just two minutes after the San Diego State goal, junior defender Nick Lima delivered a cross to sophomore forward Paul Salcedo, and Salcedo calmly hit it past the Aztecs’ keeper. In the 24th minute, freshman forward Spencer Held got a chance to extend the lead when he dribbled his way into some open space a few yards outside the box. Although he was off balance, Held fired a shot that looked like it was going in the goal. Instead, it hit the bottom side of the top post, bounced on the goal line and ricocheted away. The crowd and the Cal bench were incensed, yelling that the ball had crossed the line and should’ve counted as Held’s second goal of the season. But the referees didn’t budge, and play continued with a score of 2-1. The Bears’ minds didn’t linger on the iffy call for long, as Thierjung put away another goal in the 27th minute. The Aztecs, however, mounted a furious comeback, but it looked as if Cal were going to hold strong in the 36th minute, when freshman goalkeeper Jonathan Klinsmann saved a penalty kick. Klinsmann, who started because redshirt senior Alex Mangels was recovering from an eye injury, timed a dive to his left to keep the Bears ahead going into halftime. Once the sudden-death overtime period began, the Bears dominated again. In the 106th minute, Thierjung sprinted down the field, ball at his feet and Salcedo at his side. Thierjung took the shot himself, and that proved to be the right decision, as he buried a shot past the diving goalkeeper to secure a hat trick and a win. After Friday’s thriller, Sunday’s matchup provided much of the same excitement. Cal again scored early, when junior midfielder Trevor Haberkorn scored in the third minute. The opponents again answered quickly, with the Bruins tying up the match in the 10th minute after a well-placed pass set up an easy finish. UCLA was in control of much of the first half and went into the break with a 2-1 lead after another goal in the 43rd minute. Mangels, who started the game for the Bears, was pulled out in favor of Klinsmann in the second half. This time, it wasn’t for health reasons, with Grimes citing Klinsmann’s ability to distribute the ball as the main reason for the change. Things looked bleak for the Bears, but they shifted in the 57th minute. Salcedo was in a one-on-one with UCLA goalie Juan Cervantes, who lunged at Salcedo. Cervantes’ poor tackle on the play earned Cal a penalty kick and the goalkeeper a red card. Carrera-Garcia stepped up to the line for the kick and knocked it into the net as UCLA’s new keeper dove the wrong way. With the score tied, 2-2, it was a whole new game for the Bears, and they did not hesitate to take advantage of a clearly rattled Bruins squad, which earned four yellow cards in the second half alone. Cal scored again just four minutes after the penalty kick, when Carrera-Garcia delivered a free kick perfectly to Held, who headed it in. Carrera-Garcia tacked on yet another goal in the 83rd minute, when he chipped it over the Bruins’ goalie. UCLA scored on a penalty kick of its own in the 87th minute and had a chance to tie the match on a corner kick with 10 seconds left. The Bruins couldn’t capitalize and gave the Bears their second 4-3 win of the weekend. Hooman Yazdanian covers men’s soccer. Contact him at [email protected]. Follow him on Twitter @hoomanyazdanian.